This type of protection cannot be found in backpacks on the market. 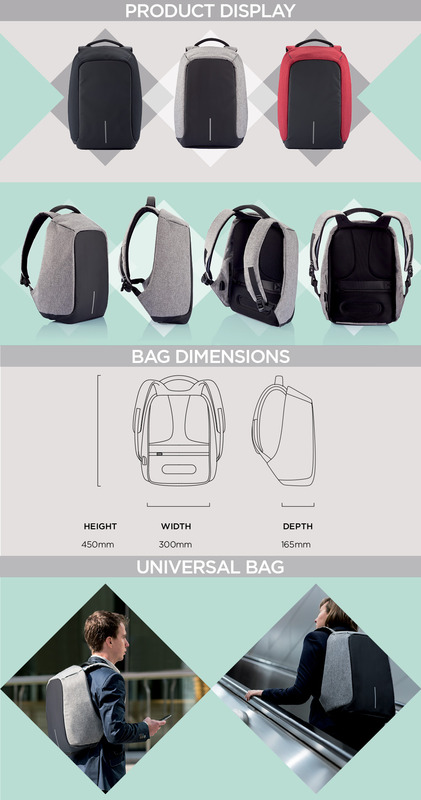 Finally we decided to design a backpack with these features ourselves. 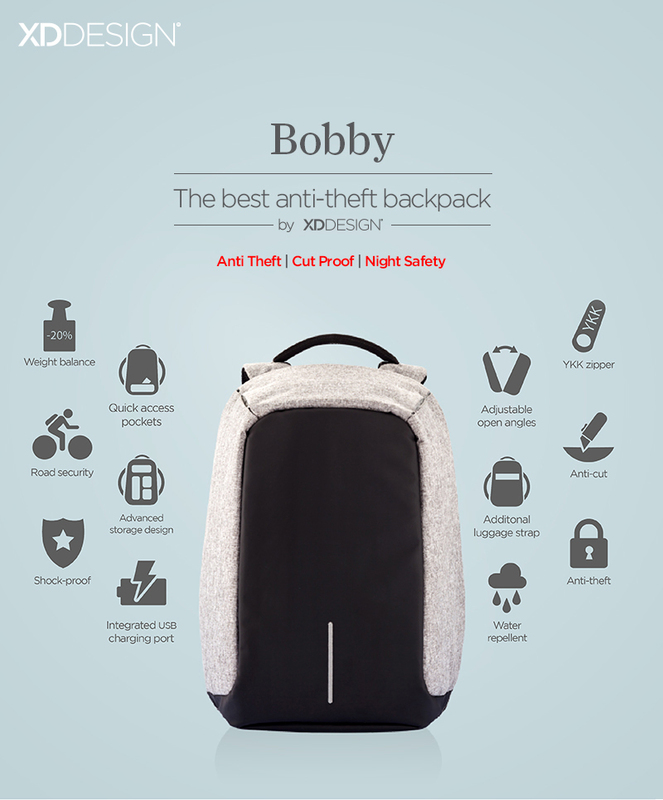 "Bobby, The best Anti-Theft backpack"
Besides being the safest backpack it is also the most convenient backpack with features such as: an integrated USB charging port, weight balance, water repellent fabric, illuminating safety strips and luggage strap. When thinking of creating an anti-theft backpack you also end up thinking about law enforcement. The bag should function as if it was protected by a personal police officer. Untouchable for thieves. Bobby is the well-know nickname for the London Police Force that was created in 1829, characterized by the round top policehat. London as one of the busiest commuter cities in the world, and the starting point for this Kickstarter project became the inspiration for the name. What is more trustworthy than having the support of the policeforce on your back while traveling? Q - Is the backpack 100% waterproof? A - The backpack is water repellent (the whole bag, not just the front part) but not waterproof. This means that in normal rain conditions you should be safe and all your belongings will stay dry, however the bag is not intended to protect your belongings when thrown in a pool :) or to be in a full rain pour for let's say an hour. Q - Will my laptop fit? A - The Bobby has a special pocket to keep your Laptop safe and secure during your travels. 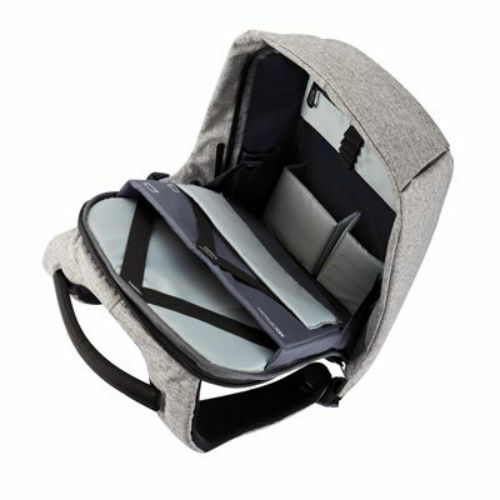 This pocket is big enough for all laptops up to 15,6" Is the bag suitable as a camera bag? We have seen that many of our Kickstarter backers are also photographers, and we get a lot of questions if your DSLR will fit into the Bobby, the answer is, YES! Q - Is the bag suitable for school/college? A - The answer is again, YES! When already having your laptop and tablet in the backpack your still have plenty of room for many books of different sizes and formats. We have tested this, and we have pictures available please contact us. Q - Is there a powerbank included in the backpack? A - No, the backpack will be delivered without the powerbank. There is a simple connection inside the backpack that make sure that you can easily connect all powerbanks that are on the market (by USB plug). This way the powerbank will never be outdated and you can keep using new models to charge your devices. Because this backpack will last for years! Q - Is the USB port also water resistant? A - The USB port is surrounded by a synthetic casing with the opening on the bottom inside the casing. This will make sure that water will run around it and not get into the USB port. Also once plugged in it is closely fitted to this casing making sur no room is left to let in water. The placing of the USB port is also on the inside of the backpack at the part which is closely fitted to the side of your body, which already means that a small amount of water would reach this part. And for the really heavy rain fall we will add the fitted rain cover in our stretch goal which will also 100% protect this part of the backpack against water. Q - What are the dimensions of the compartments inside the backpack? A - Please find below all the separate dimensions. Please note that all compartments are made from flexible materials and are easily bendable. 27cm width x 33cm height (up to elastic band is 40cn x 3,5cm depth. 25,5cm width x 12cm height (up to elastic band is 18cm) x 1cm depth. 9cm width x 14cm height x 5cm depth. 13cm width x 14cm height x 5cm depth. 20cm width x 10cm height x 3cm depth. 28cm width x 13cm height x 2cm depth. 12,5cm width x 15cm height x 2cm depth. Q - What is the content of the backpack? A - The Bobby backpack will hold 13L. Q - What is the weight of the backpack? A - The weight of the backpack empty is 850 gr. Q - Will my 17" laptop also fit in the Bobby? A - The laptop compartment is made to hold a laptop up to 15,6". Please also find the exact dimensions as below of this compartment. 27cm width x 33cm height (up to elastic band is 40cm x 3,5cm depth. A 17" inch laptop unfortunately will not fit. Q - Is the Bobby washing machine proof? 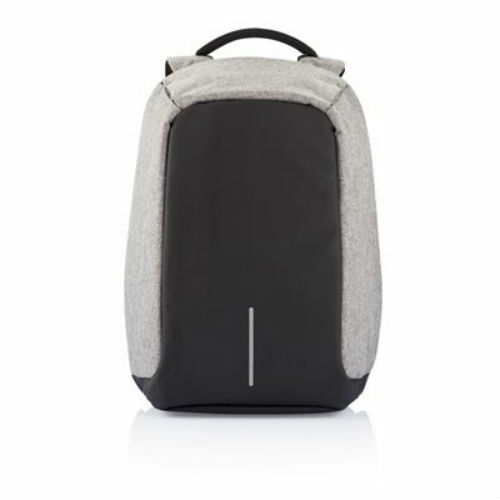 A - The Bobby is not washing machine proof, however since the whole backpack is made from water repellent material the backpack is already better protected against dirt and stains attaching to the fabric. And it is easily washable with a wet cloth or wipe. The cable can also easily be removed, there is a secret compartment inside the backpack (with a zipper) where you can easily reach inside the backpack and unplug the cable from the protective shell. Q - What is the output of the cable?